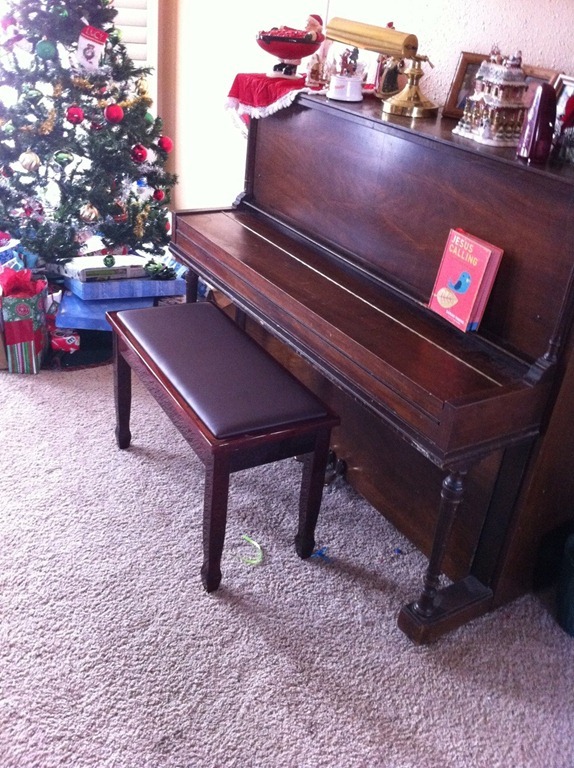 Since two of our Christmas gifts were piano related: a new bench for Lori’s piano and a new electronic keyboard (for practicing with headphones! 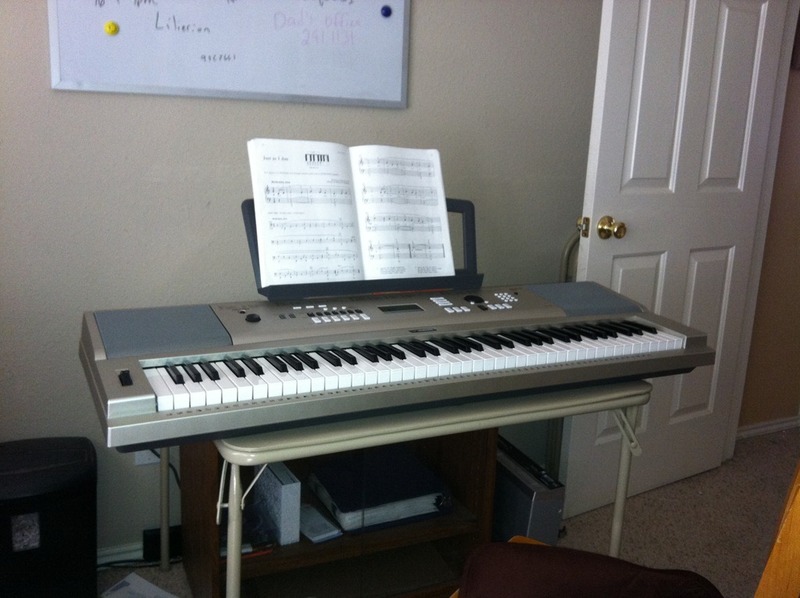 ), I’ve been practicing some of my old piano skills. 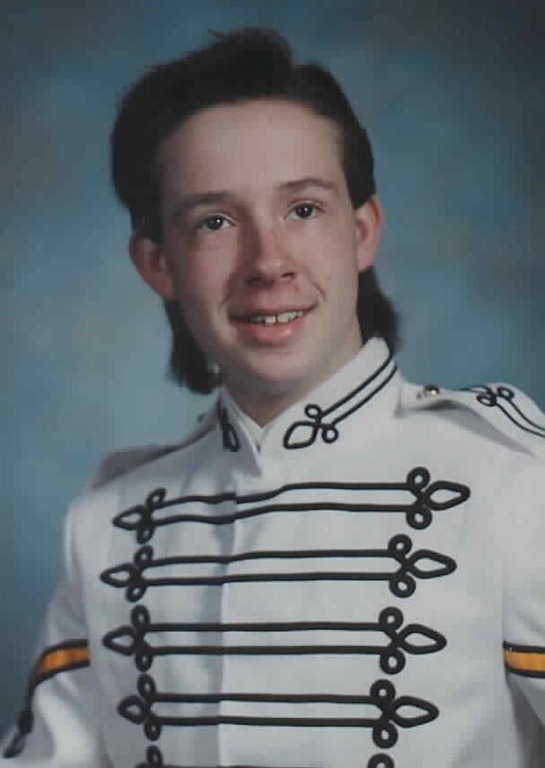 I was fortunate enough to have made it through a few years of piano lessons as a boy and I was most definitely a band nerd in high school (see the picture, if you dare). I was even drum major and marched at the state competition in the fall of ‘92. There was a time when music was a BIG part of my life. When it comes to the piano, I’ll confess that I really wasn’t all that accomplished, but that didn’t stop me from trying to prove to people that I was. Over my Junior High and High School years, I managed to learn the first 2 or 3 lines of a dozen or more songs, ranging from pop music to Popeye, the Sailor Man. If the mood struck me, I would demonstrate (i.e., show-off) my mad piano skills with just a few bars of something real fancy. New friends would ooh and aah and old friends would begin to wonder why I never finished a song. Truth is, I never had the discipline, or possibly the skills, to finish one of them. On the other hand, I did learn quite a bit from my days playing trumpet, tuba and the baritone in the band. There’s no doubt in my mind that the discipline and skills that I learned from those activities helped me in other areas as well, but even so, I often feel like those days were wasted when I’ve all but dropped music from my life today. For some time, I’ve been meaning to take it up again. I’m not sure exactly how, though. Currently, I’m going back through some of my previous recital pieces, lesson books, and daily piano “exercises”. It’s turning out to be much harder that I remember. I’m only a few days in but it’s going to take quite a while to knock off the cobwebs, so to speak. Also, my mom has given me back the trumpet that I played in Junior High. I haven’t started yet, but I’m considering working my lip back into shape. Since I work at a university, I’ve also considered walking over to the band director and asking to practice on the old Tuba. After all, I’ve probably spent more time playing it than any other instrument. I look forward to my kids involvement in music as well. Emily’s already close to where I was when I stopped taking lessons. Emily’s qualified for all-city choir at school. Timothy and Emily both sing in an area chorus for which they had to try-out and get accepted. Zachary loves fiddling with the piano and keyboard, more so than the other two, in fact. All three sing in the children’s choir at church. There’s no doubt that all of them are musical. The icing on the cake is that Lori is a wonderful pianist and we can all still go to her with all my musical theory questions and she’ll set us straight. I’m glad that she decided to join up with handbells at church, as well. Music is important to our family and I hope to keep it that way. Music has always been a part of my life and I’m glad I could pass some of that on to you. Although I’ve given up my passion for the trumpet/cornet, just don’t have the “wind” for it any more, I still love to sing and pray God allows me to continue that for many years to come. You definitely deserve the credit for my musical interests. Thanks, Mom!